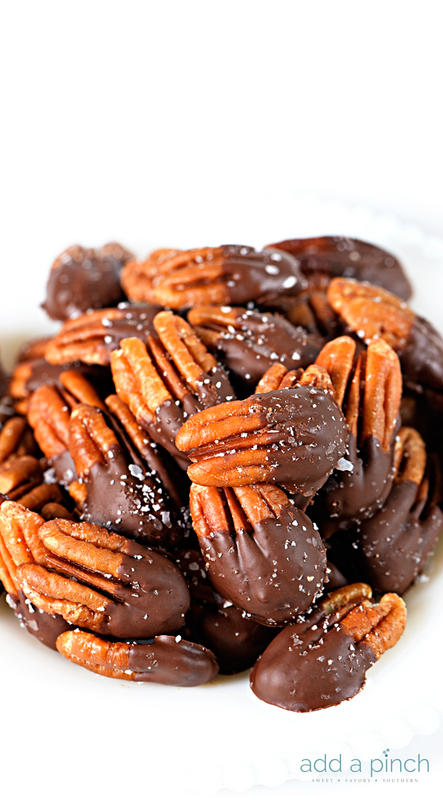 Chocolate Dipped Pecans make an easy, yet elegant treat perfect for entertaining and gifts! Around my house, pecans are the king of all nuts! 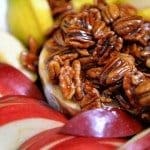 Bart loves them something fierce and I try my best to keep a bowl of simple roasted pecans around for adding to salads, oatmeal, and even just for quick snacking. 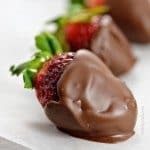 But, there are times when I want to make them even more special and give them a quick dip in melted chocolate for good measure! They really couldn’t be simpler to make which makes them the perfect little treat for me. Especially this time of year! 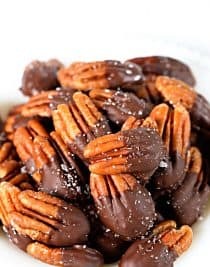 I begin with those roasted pecans that I mentioned and then dip them in a bit of dark, milk, or semisweet chocolate that I’ve melted with a little coconut oil in the microwave. 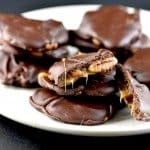 Once I’ve dipped them, I place them onto a parchment lined rimmed baking sheet and sprinkle with a little bit of Kosher or sea salt as a finishing touch. If you don’t have Kosher or sea salt, you can use whatever salt you have on hand, but the flakes of the Kosher or sea salt just look extra pretty on the pecans, I think. Once the pecans have completely dried, they look delicious in a bowl on the table for serving, but always make a welcome gift in a bag tied with a pretty ribbon for gifts! 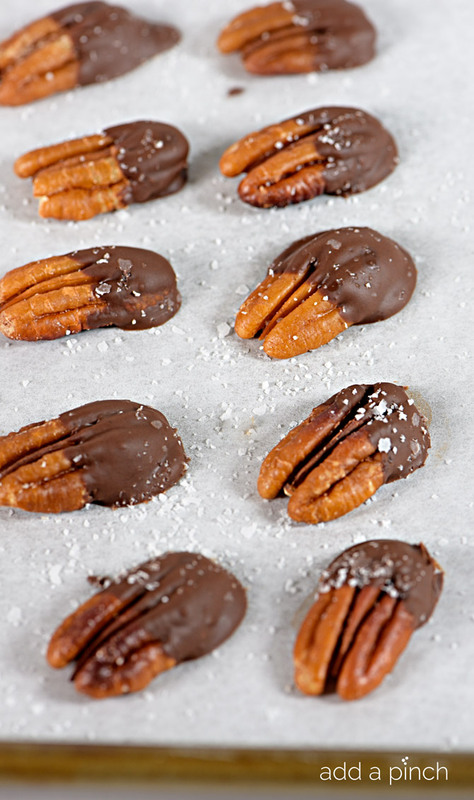 Here’s the super easy Chocolate Dipped Pecans recipe. I hope you love them as much as we do! Prepare simple roasted pecan halves according to the recipe instructions. Allow to cool completely. Meanwhile, add chocolate chips and coconut oil to a glass bowl. Microwave at 50% power for 1 1/2 - 2 minutes. 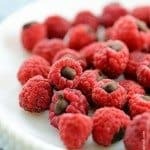 Remove from microwave and stir until smooth. Dip each pecan half halfway into the melted chocolate and place onto the parchment lined baking sheet. Repeat until all pecans have been dipped. 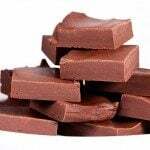 Sprinkle with salt and allow chocolate to dry completely. I love these, a friend gave me a box of these and they were delicious and fun to eat. Oh Gosh. my weakness!!! Pinned. 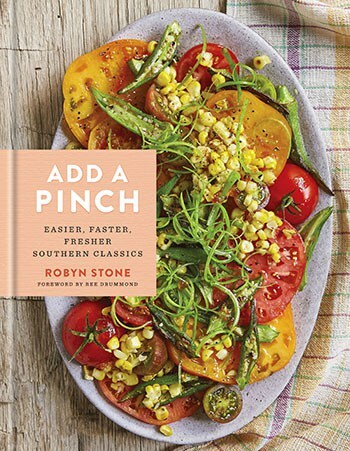 Thanks for sharing, Robyn. These would make such a cute stocking goodie! I love these. The pecans look delicious. I need to try them. You can use shortening instead or use a refined coconut oil that doesn’t have the taste or smell of coconut. I hope you enjoy them! 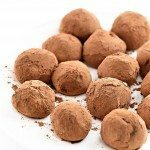 These look divine (and divinely addicting!) I’ll have to make two batches….one to keep, and one to give away.